The rents that Aylesbury tenants will have to pay to stay on their newly developed estate have finally been revealed by Notting Hill Housing Trust – and they are shocking. A one bed flat on the first development site will cost £157 per week inclusive of service charges, compared to a current inclusive council rent of about £105 per week. A new 2-bed flat will be £166pw, against current council rents on the Aylesbury of £124pw for a 2-bed inclusive of service charges, heating & hot water. According to Notting Hill, it will use the Guidance for Rents on Social Housing and the Rent Standard Guidance for calculating Aylesbury rent levels, but it is hard to reconcile that with these forecast rents, which are way beyond the reach of anyone who depends on social housing. The median average household income of a council tenant in Southwark is £9,100 per year, according to the council’s latest housing data, so any Notting Hill claim that these are social rents is ridiculous. The rents information was supplied by Notting Hill Housing in response to questions from the 35% Campaign. It follows a protracted argument as to what exactly ‘target rent’ is (Notting Hill’s preferred term for social rented housing). 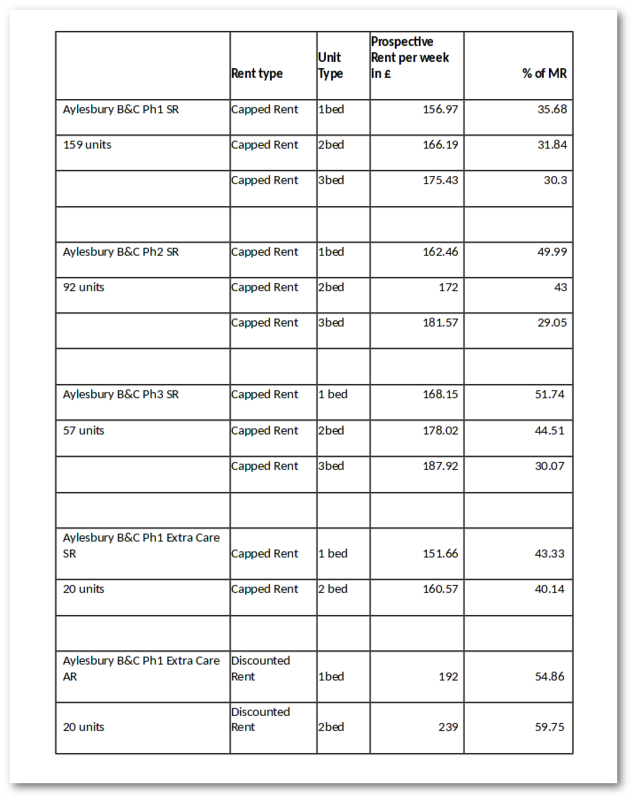 During consultation on the Aylesbury planning applications, Notting Hill claimed “we don’t yet have the information to be able to calculate target rents for the new Aylesbury homes” and its excuse was repeated in answer to questions at the planning committee in April. However the figures supplied to us date back to last year when it applied for funding to the Greater London Authority and this has been confirmed by the GLA. 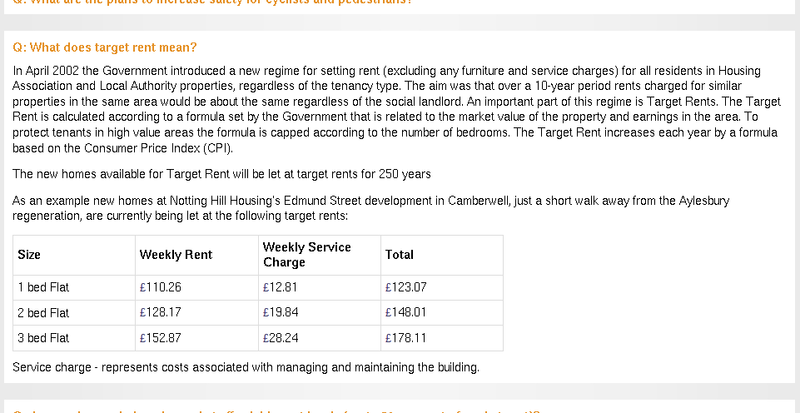 The figures are also higher than the rents for Edmund Street, Notting Hill’s new build scheme that Aylesbury tenants were referred to by Notting Hill, in the absence of the rent figures it claimed it did not have. A one-bed at Edmund Street is over £30pw cheaper at £123pw inclusive and a 2-bed is £18pw cheaper at £148pw. The new Aylesbury rents will apply from 2018, when phase 1 of the First Development Site is completed. Both the GLA and Notting Hill add caveats to them, claiming that they are just ‘prospective’ and ‘forecast’ rents, and ‘are subject to market forces and government policy.’ but because the figures are the basis for funding the redevelopment, they cannot be reduced without consequences, so we think Notting Hill is unlikely to reduce them by their own volition. The table of rents shows that rents will also rise further as the redevelopment progresses. Phase 2 one beds will be £162.46, two-beds £172, three beds £181.57. Phase 3 rents rise to £168.15, £178.02, £187.92 for one, two and three bed flats respectively. One of the big promises to Aylesbury residents, to justify knocking down their estate, was that 75% of the affordable housing, 1300 homes, would be social rented (referred to interchangably by councillors as council rent). Social rented housing is supposedly guaranteed in the Aylesbury Area Action Plan, the redevelopment’s planning bible. But Southwark and Notting Hill have been systematically undermining the very idea of social rent by introducing all sorts of new names for it, as we have documented – target rent being the worst and most misleading. 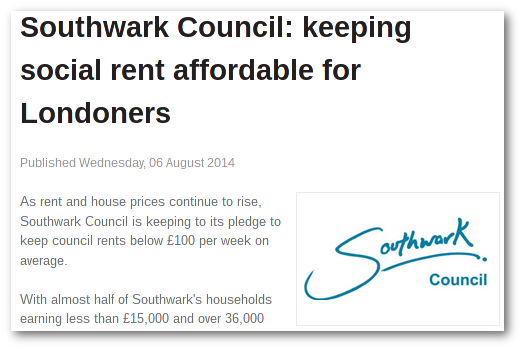 But the figures don’t lie and while Southwark keeps council rents in the borough below £100 per week on average (something it is quite properly proud of), it also allows Notting Hill to rack-up Aylesbury rents to levels that make a nonsense of its declaration that they would be ‘similar to council rents’. Council rents remain the true benchmark for social rents and while housing association rents have always been a little higher, it’s clear to see that rents of £157 per week are well above these levels. More footage from the Public Inquiry is also available online via this link.